With a razor sharp screen and the components to match, this 4K laptop could send Apple shaking. It's easy to clamor for 4K laptops, 4K TVs, 4K screens everywhere. But it's also important to ask, "Why do I need or want 4K?" Toshiba looks to answer that question with its Toshiba Satellite P55t 4K Ultra HD, a 15.6-inch clamshell with a popping 3840 x 2160 IGZO screen. That's a whopping 221 pixels-per-inch, for those counting. But what use does a screen this sharp have? Photo slash video editing and design work, that's what. The Japanese vendor has positioned this razor sharp laptop against the MacBook Pro 15-inch with Retina display as one designed for folks in industries or education tracks that rely heavily on these tasks and skills. Backing up that pixel-packed panel is a quad-core Intel Core i7 processor, an AMD R9 M265X graphics chip with 2GB of GDDR5 memory, 16GB of RAM and 802.11ac Wi-Fi. To store all of those 4K-sized videos and photos, Toshiba threw in a 1TB hard drive. Plus, four – yes, four – USB 3.0 ports to move those files as quickly as possible. At least not yet, though with 802.11ac networking, this laptop is ready for the day when Netflix goes 100% 4K. Anyway, there are two aspects to the Satellite P55t that will perhaps instill the most faith that this laptop is geared toward quality, high-res digital media creation. First up is that every P55t box will include a copy of Adobe Photoshop Lightroom 5, arguably the most advanced photo editing software around. This move is essentially Toshiba saying, "Photographers, this laptop is for you." Whether it will work is another thing, but it's undoubtedly a powerful gesture. Second is that this 221-ppi display has been Technicolor-certified using Chroma Tune, digital imaging company Portrait Display's color-correcting software. Essentially, the P55t's 4K display's color gamut is as true to life as Technicolor deems possible. In collaboration with Toshiba, every P55t will come preinstalled with the app, which you can then use to calibrate the screen's color reproduction to your liking. You can even set color profiles to activate upon launch of attached apps. That list of specs is undeniably top end, and 221 is one of the highest pixel-per-inch counts we've seen on a laptop, just a hair above the comparable MacBook Pro's 220 ppi. But numbers aren't everything. And while everyone will tell you that looks aren't either, they matter when you're spending more than $1,000 on a product. Despite its brushed aluminum finish and chrome-lined clickpad, the P55t looks just like any other Satellite laptop in silhouette. It's a look that never really wowed me, and it's certainly nowhere close to Apple's trademark aluminum unibody construction. That said, Toshiba did upgrade to a frameless, LED-backlit keyboard for this model, and to great effect. I just wish the overall design aesthetic and frame materials matched the premium components and software to make for a holistically luxury package. While I wasn't wowed by the design of the P55t, those specs are undeniable. (Did I mention it also sports a Blu-ray drive?) And for such a sharp screen, it wasn't as bright as I would expect a pro-grade display to be. Perhaps that aspect of the panel was still under testing ahead of launch. Despite this, I can't help but respect Toshiba's effort – it's one of the first out of the gate with a 4K laptop, and should be commended for that endeavor. And 802.11ac Wi-Fi sets this machine up for the next five years, at least. Directly stacking up this 15.6-inch beast against the leader for designers, photographers and videographers is an audacious move, to say the least. 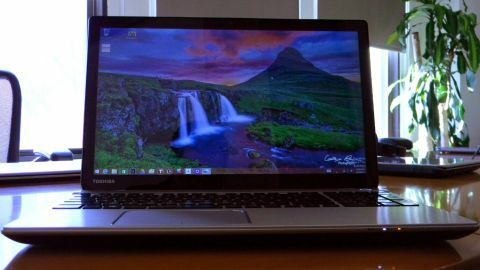 At a starting price of $1,499 (about £896, AU$1,601) for its April 22 launch, the Toshiba P55t 4K Ultra HD could make quite the splash in Apple's pond.